In July the Venezuelan government launched its newest anti-crime initiative: “Operation Liberation and Protection of the People” (hereafter referred to as OLP). The operations sends heavily-armed police and military forces to reclaim the State’s monopoly of violence over poor areas supposedly under the control of armed non-state actors. “What we have seen in the past weeks is nothing compared to what we will see in weeks to come. More than 20,000 National Guard officials will graduate next week and they will immediately see action in the OLP. I ask for national unity around the OLP. Enough of these criminals, paramilitaries, assassins, and sicarios!” said Maduro. The launching of the OLP was not accompanied by the publication of any official resolution stating its definition, purpose or aims. It was only announced by the Minister of Interior in a press conference the day after the operation in Cota 905 started. It has so far produced hundreds of arrests. There are no official figures on the total of deaths in all the OLP operation around the country, however press reports show at least eighteen civilians have died (see here, and here). These deaths supposedly took place in the course of armed confrontations, however we found no reports of security force casualties. Several eyewitness accounts speak of families being forcefully evicted from their homes and abused by security forces. While President Maduro has called the OLP “the perfect instrument for peace” human rights groups suggest it looks more like the highly repressive Plan Unión from the 1980’s. The Programa Venzolano de Educación-Acción en Derechos Humanos (PROVEA) says the scale of human rights violations has been “massive,” and that the government’s narrative about the supposed presence of “paramilitaries” has turned the OLP into a “pogrom” against Colombian immigrants and barrio residents. PROVEA reports it has attended “hundreds of cases of forceful eviction” by the OLP, just in Caracas. The Comité de Familiares de las Víctimas (COFAVIC), another historic Venezuelan human rights NGO, said that giving security officials orders to break into people’s homes without judicial orders amounts to “irrefutable signals” that they can act with impunity. COFAVIC has asked the Venezuelan government to open an independent inquiry into the operations. Critics have also strongly questioned the effectiveness of the OLP. A report by the pro-opposition daily El Nacional claims that of the 346 arrested in four operations in Caracas, only forty-seven have been formally charged. The leaders of the criminal gangs were not found as most have inside contacts in the security forces and were forewarned of the police operations. In an extensive report about the “Peace Zones” controlled by criminal gangs, BBC’s Daniel Pardo, interviewed gang members who also claimed that the real gang leaders easily avoided arrest in the operations. Activist Keymer Ávila argues the OLP is far from being an effective way of combating crime: “In terms of a cost-benefit relation, this has no logic,” writes Ávila, “[in the case of the Cota 905 operation in Caracas] they took hundreds of people out of their homes in order to arrest one person who was wanted for sexual abuse (nothing related to organized crime), two for small scale drug dealing, fifteen apparently for being foreigners (as if such condition were in itself a crime. )…And how many ‘paramilitaries’ or members of criminal gangs did they capture? Not one.” He suggests that citizen security needs to be clearly distinguished from national security. But some revolutionaries themselves have raised their voices. 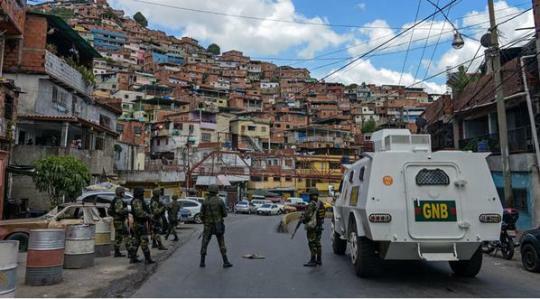 Pro-government collectives from one of the areas affected by an OLP published, via the Chavista webpage Aporrea, an open letter addressed to President Maduro denouncing that more than 350 families had suffered police abuse and had been displaced from their homes by the operation. The Ombudsman, Tareck William Saab, admits that his office received at least twenty claims of cases of “police excesses” committed in OLPs, but also defends the need for the operations: “Those [areas] were closed territories, they [criminal gangs] put up check-points and murdered policemen and national guards, they even shot at a minister’s caravan passing by. There was a national appeal [clamor] against what was happening there, and there was a police operation. We have in fact received very concrete denunciations about how some of the arrests were made,” said the Ombudsman. Opposition leader and candidate for the coming legislative elections Delsa Solórzano said that the group of MUD candidates already has a draft of laws on the issue of citizen’s security. “The details of the laws will be presented in a few days during the electoral campaign…and they will deal with the problem of insecurity in an effective and non-sensationalist way, respecting human rights, not like the OLP” added Solórzano.